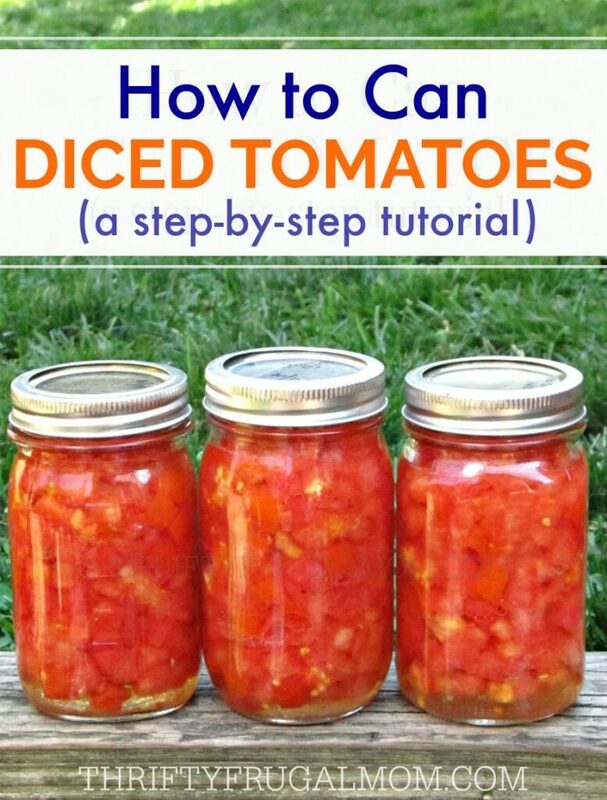 A step-by-step photo tutorial on how to can diced tomatoes. It’s super easy, plus if you grow your own tomatoes, it’s a big money saver too! I started canning diced tomatoes several years ago after having an “aha moment” one evening while preparing dinner. As I was opening a can of diced tomatoes that I needed for the recipe I was making, I suddenly wondered why in the world I never tried canning them myself. I mean how hard could it be? I grew up helping my mom can tomato juice and tomato chunks. And every year since we’ve been married, I’ve canned tomato juice as well as things like salsa and marinara sauce, so I was quite familiar with the process of canning tomatoes. I decided to give it a try and it worked like a charm! It was not only super simple, it has also saved me from needing to buy diced tomatoes from the store. 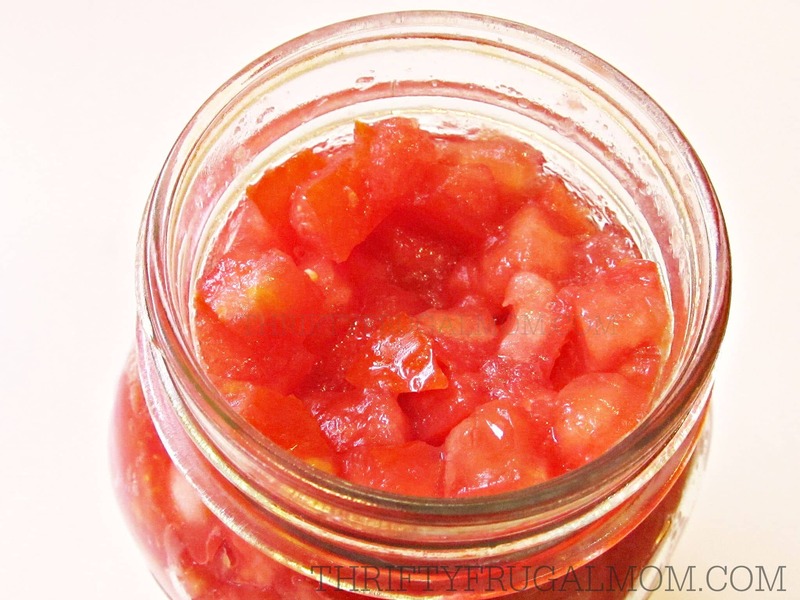 Want to try canning diced tomatoes, too? I’ll be happy to walk you through the process! – This gadget is also awesome for dicing tomatoes, onions and peppers for salsa and potatoes and carrots for soups. 1. Wash tomatoes thoroughly. Cut out the stem and any defects or blemishes. Some people also peel the tomatoes, but I never do and we honestly have not noticed the peelings at all- and I’m even funny about textures like that in food. I figure why bother with the extra step, plus it’s a bit healthier too! 2. 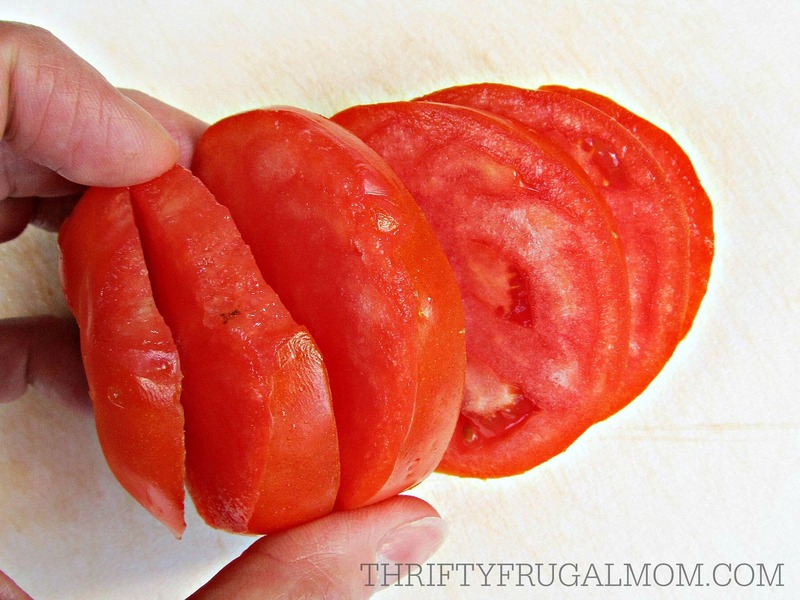 Slice tomatoes into about ½ inch thick slices, then dice them into whatever size you want. I love using my Vidalia Chop Wizard for this! 3. 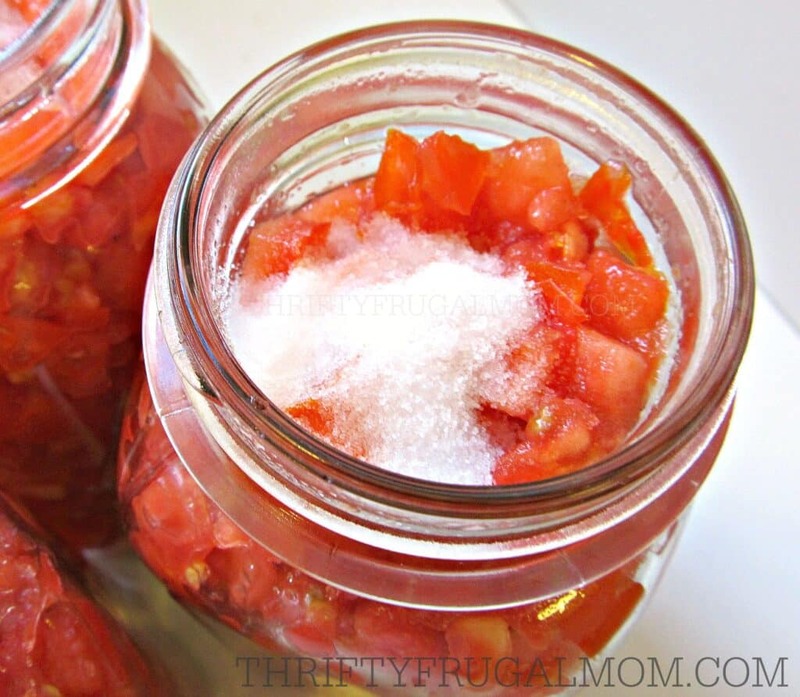 Place diced tomatoes into a clean canning jar- a funnel makes this super easy. Gently shake jar to settle tomatoes so that you can fill it completely. The jar should be full to the base of the neck. Updated to include the instructions to add lemon juice after several readers commented and said that to be safe, you really should add it. 7. After processing for 45 minutes, turn the burner off. Remove jars using jar lifter- you may want to have a dishrag in your other hand to catch any hot water that drips from the jars as you remove them- and place on an old towel, blanket or another padded surface. (This is to protect your counter from the super hot jars.) Allow at least a little bit of air space around each jar, making sure not to have jars close enough to touch. Do not move until jars are completely cool. Jars should seal as they cool and you will typically hear a snap or pinging sound as the vacuum seal is formed. Lids will be slightly concave when sealed. To test the seal, once jar has totally cooled, lightly tap the center of the cooled jar lid. If it is firm and does not move, it should be sealed. If it pushes in, it didn’t seal properly. You can still use unsealed jars, just put them in the refrigerator and use them as soon as possible. HELPFUL TIP: 1 pint of canned diced tomatoes is equivalent to 1 (15 oz.) can of diced tomatoes. Learning how to make my own diced tomatoes and can them was on my goal list this year, and I completely forgot about it! I just happened to come across your post on the Inspire Me Monday linky party. Thanks! Oh, that's awesome, Jessica! Hope you are still able to do it. It's not hard, especially once you get the tomatoes diced. What would cause your tomato juice to be real dark red. Are you asking about the tomato juice in my picture or are you asking because you've canned tomato juice yourself and it was dark red and you were puzzled as to why it was so dark? If it's my juice, it's a combination of 2 things. The lighting in my kitchen made it look a bit darker than it really is, but I've found homemade tomato juice is also often darker than store bought. I don't know if it's the type of tomatoes that are used or if it's because the tomatoes that I use are typically quite ripe and nice and dark red and the store bought stuff is made with less ripe tomatoes or what. The other thing is that I juice mine pretty hard and so it is thicker than store bought canned tomato juice too, which might make it darker. At any rate, my juice is often just a bit lighter than the picture shows, so still fairly dark. Hope that answered your question! What kind of tomatoes do you like to use? I grew Roma variety especially for caning as I think it is the best for that purpose. Roma tomatoes are great, especially for making tomato juice or spaghetti sauce since they are more meaty and not as juicy! For things like these canned diced tomatoes or salsa, I'm fine with using a regular tomato since the meatiness of the tomato isn't really something that matters as much, although I have used them for making diced tomatoes occasionally too. If I'm growing my own, I usually pick an heirloom variety like Brandywine. But many times I just buy them from a semi-local tomato grower that sells their seconds for really cheap and so I obviously just take whatever they have available. Thanks, Melanie! There's something about preserving my own food that just makes me feel good. And when it's as easy as this, it makes it even more fun! I found a really handy magnetic lid lifter at walmart for under a dollar. It works great for getting the lids out of the water! I will be canning tomatoes today! I've heard that there is such a thing, Robyn. I grew up helping my mom can and we always used a fork to get the lids out so to me it's just easier that way. But the magnetic thing would probably be handy, especially if you are concerned about burning yourself with the water! I used to use a fork but found the lid lifter at walmart and love it. Have you used this recipe/method before? I loved how easy it was and have made a few batches now following this method. You had me at "no peeling";)! 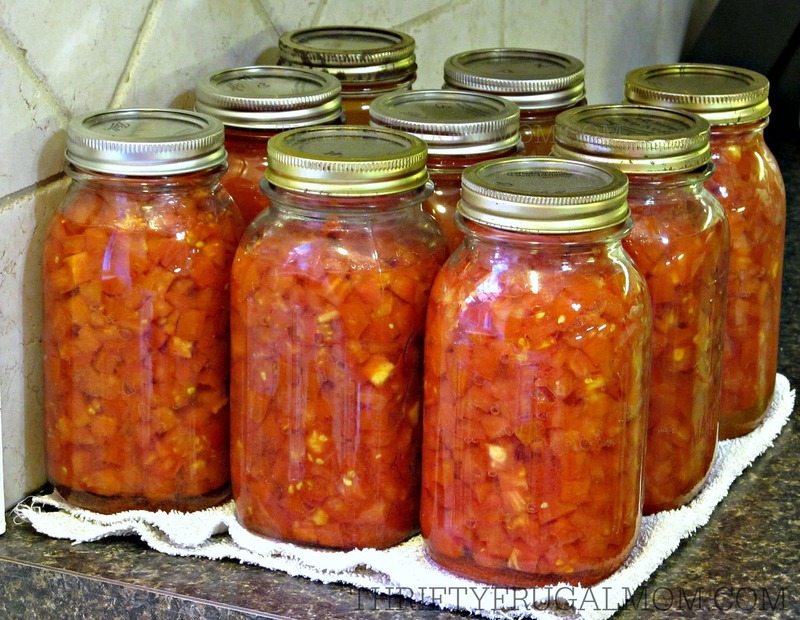 I have had two family members now question me about the safety of the method (or really, question me about canning tomatoes in general- especially without pressure canning). I even added a tablespoon of vinegar to each pint jar to make it more acidic to reduce concerns of botulism. I just wanted to follow up to see if this is a tried or tested method or get any input on canning safety. Tomatoes have a pH (acid) level that is just above the line dividing high-acid foods and low-acid foods. It is important for the safety and quality of tomato recipes that the proper acid level is maintained. Since many factors can decrease the natural acidity in tomatoes, the addition of bottled lemon juice or citric acid helps ensure the correct acidification. Bottled lemon juice must be used because its acid level is consistent, unlike fresh lemons. Recipes that include an adequate amount of vinegar (5% acidity) do not require additional acidification, such as salsa, tomato chutney, and pickled tomatoes. How long after jarring them are they good for one week two weeks a month 3 months 6 months a year? They're good for at least a year. I've had some longer than that and they've been fine too. So handy! I did some tomatoes with the skin on last year and I found they were not the first ones I felt like using. I liked the skinless better. You have to try this method of removing the skins if you have never done it like this before. I took a whole box of tomatoes from the farm and emptied them in my sink. Rinsed & sorted them quickly. I poured a canning pan full of water over them and waited till the skin split. About ten minutes. I drained the sink, let them cool a bit and cored and skinned them in less than a half hour. It was amazing. No pulp left on the skin either. The farm attendant shared this with me. Feel free to share. My business website has a link to my utube channel and I think I will publish this video I did today. Thanks for your channel. I had good luck last year with your recipes. Thanks for that tip for removing skins easily. I've heard of dumping the tomatoes into boiling water, but this sounds much easier...enough so, that I'm tempted to give it a try next year! I'm trying my hand at canning right now! so easy! Wondering, what is the shelf life for tomatoes? I'm sure they won't sit too long on my shelf but would like to know for my own knowledge! That's great, Connie! And I love that you've found it to be easy because I think often people get scared away from canning because it seems complicated, when overall, it's really not that way. I don't know the official answer too your question about how long tomatoes are "good", but I can tell you that I recently discovered a couple of jars that were 2 years old (yes, I apparently didn't do a good job of rotating my jars!) and they were just fine when I used them. Hope that helps and happy canning! You mean kind of like Rotel? I wouldn't know why not. The only thing I can think of is that the peppers might get mushy. You could also google Homemade Rotel or something like that too and see what you can find! There are a few more steps you really should be taking here. You NEED to add 2Tablespoons of lemon juice to each quart jar or 1Tablespoon to each pint. (you won't taste it). But this will prevent botulism from developing. Tomatoes are less acidic than fruits so if you do not add the lemon juice, you should be pressure canning them. (You can also use citric acid by Ball) Also, use a rubber spatula to go up and down around the jar to remove air-bubbles. This will prevent too much air in your jars and lid failures. You do not need to boil the lids. Boiling can actually cause the sealant to come off and cause seal failures. Wash them and put them in WARM water to soften the seals. Ball is actually saying now that you don't even need to heat them at all now. 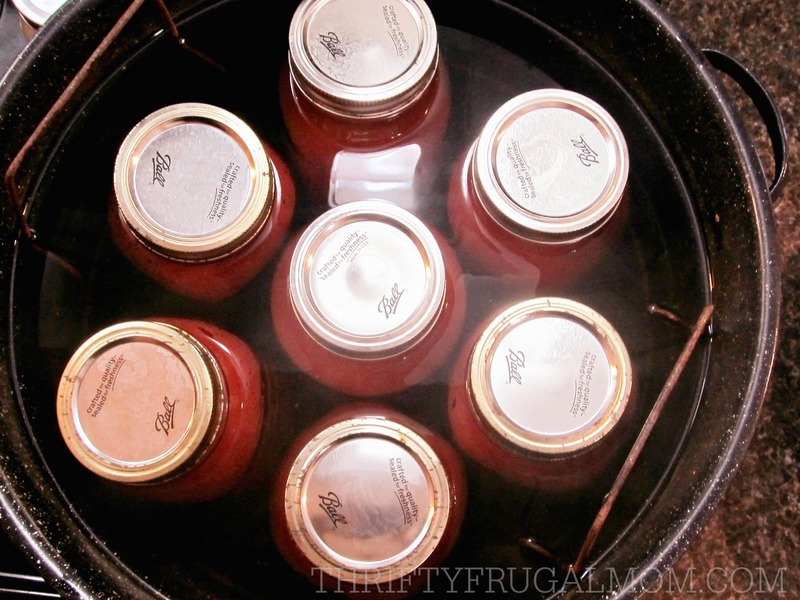 (they will sterilize in the water bath just like the contents of the jar) Your jars should be hot before canning. This will prevent jar breakage in the canner. I put my canning jars in the dishwasher and run a cycle and take them out to use during the dry cycle. Please take canning safety seriously. If you have any seal failures, put the food in the fridge and use it up. If you have any seal failures after storage, throw it out. Anything off, throw it out. For proper canning step-by-step, check out a copy of The Ball Blue Book, or any state cooperative extension service website. Just another safety note: jars should be covered by an inch or more of water while in the water bath canner. My grandmothers, mother, and I canned tomatoes exactly as ThriftyFrugalMom has described, without adding lemon juice or pressure canning. Never ever had a problem with botulism. 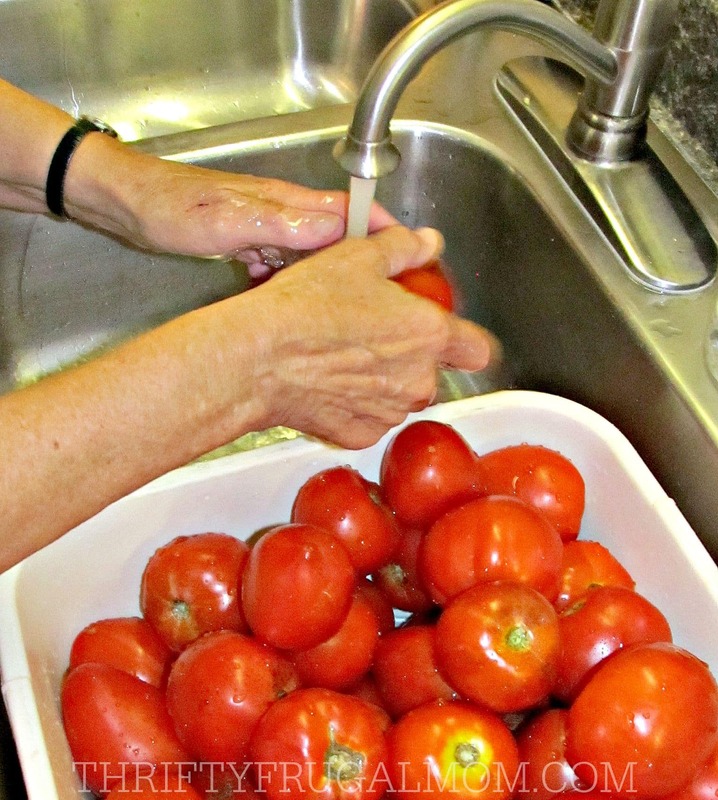 Just make sure your equipment, jars, lids, etc are sterile and that your tomatoes are washed properly. We all removed the tomato skins by dipping them in boiling water until the skins cracked, plunging them in cold water, then the peels come right off. That also helps to make sure they are very clean. Yes, clean, sterile jars etc. are obviously a must! This was a great post considering I just canned 12 jars over the weekend. I know now that I need a new canner because mine only fits jars safely...it took awhile to get them all canned properly. Thanks I will try for a new canner next year! My jars were floating in my canner am I supposed to add a little water to the jars? No, they should create their own juice, so you don't need to add water. The jars shouldn't have been floating. Did they seal okay? Do you have a rack in your canner? And did you only put enough water in the canner to just come to the neck of the jars or just barely to the top? Those are the only things that I can think. If your jars were floating, did you have a full canner? If not put a empty jar in so that it takes up space. Fill it with water. Thanks for that info, Cara! I was thinking that it wouldn't be any different than salsa, but duh, with salsa you add other ingredients too. Appreciate the input. I just finished following your directions to the letter and included the lemon juice. I feel like I must have missed a step. When I pulled the jars out of the canner. I noticed that the jars look a little over half full now and it seems like there is too much air? Any suggestions as to what I may have done wrong or how to fix? If too much headspace is allowed, the food at the top is likely to discolor. Also, the jar may not seal properly because there will not be enough processing time to drive all the air out of the jar. Thanks for your 'do not peel first' tip. I used it and saved lots of time. I would love to can my own Marin are sauce. Do you plan to share your method? I believe it has to be processed in a pressure canner, but I have been unable to find a recipe or method so far. So glad that tip saved you time! It's been a big lifesaver for me too. I didn't need to make any Marinara Sauce this year since I had plenty left from last year, so I won't be sharing my recipe until next year. And no, it doesn't have to be pressure canned as long as you add bottled lemon juice to help the acidity. If you do a search on Pinterest or Google, you should be able to find some Marinara recipes. (I just did that and there were quite a few. I would link to a couple, but I wasn't sure exactly what type of marinara you were looking for.) Hope that helps! https://www.lehmans.com/p-4871-magnetic-lid-lifter.aspx I purchased a magnetic wand at Fleet Farm for removing lids and rings from the boiling water. Best. Invention. Ever. I noticed my fork or tongs were scratching the underside of the lids. This is my favorite canning tool next to my funnel! Good to know, Adrienne! I know a lot of canning kits come with those little wands. First of all, I think it's just great that you grow produce with your daycare kids. What a great way to teach them practical things! In answer to your question...I've only ever frozen really small amount of canned tomatoes (you know, when I had just a tiny bit left that was going to spoil otherwise) and I have only used those in soups. But I think that freezing them diced like this would probably make them much too mushy to use in most recipes that call for canned diced tomatoes. They would probably work fine for something like Tomato Basil Parmesan Soup though, since there you kind of want them soft anyway. Hope that helps! Hmm....I don't think that should be a problem since it wouldn't be any different than adding spices to homemade tomato/spaghetti sauce. Hope it goes fabulously for you! Thanks so much for sharing this tutorial! I really want to get into canning this summer and I'll be using this post to walk me through the process! My husband will be so happy...he's an enthusiastic gardener and his dream is to grow tons of tomatoes and can them! I'll have him can with me! Why do you suggest to remove the bands after boiling for 40 min? Is it really necessary? Unless I am misunderstanding what the bands are? Cindy, there is just no reason to let the rings on. Once the lids have sealed, you can unscrew the ring part and then use them again for other canning projects. (It's much cheaper to just buy the canning lids without the rings. While the lids are to only be used once, the rings can be used until they get rusty and break.) Does that make sense? Or are you still confused? Ps. The lid is the part that covers the jar opening, the ring/band is the part that screws onto the jar and holds down the lid which helps it seal while being canned. Some of the recipes I've seen for canning tomatoes say to core the tomatoes. Is this not necessary? I am all for omitting that step! I've never cored tomatoes for anything, Katie, so my opinion is that you don't need to. :) Honestly, I'm not sure why you'd need to cut anything out anyway, because it should all be edible, right? Obviously if there is a hard spot or something, you'll want to remove that, but I think that probably goes without saying. Thank you so much for sharing. I had not tried canning tomatoes yet because I didn't want to take the time to peel them. I did miss the update on adding lemon juice until after I had the jars in the canner. Are my tomatoes going to spoil because of this? Just curious do you know approximately how many pounds of tomatoes equals a certain number of jars? I'm not sure if it's been mentioned in the above comments but now they recommend not boiling the seals anymore, they say just place then in some hot water. Thanks for the recipe, we have a lot of over flow of tomatoes this year so instead of them going back I am going to jar them instead. Jennifer, I heard that recently too, although I think maybe it varies on what brand of seals/lids you use? And hurray for and overabundance of tomatoes. That's a fun "problem" to have. The great thing about these diced tomatoes is that they are super easy and quick to do, at least if you have the Vidalia Chop Wizard that I mention using in my post. I always just do 40 minutes for quarts or pints. I'm guessing you could probably do the pints for just 30 or 35 minutes though since they typically don't need quite as much time as quarts. Is this just normal table salt? Thanks for the idea of dicing the tomatoes with the chopper. I've thought about getting one of those things for a while, so because of your article, I finally did. I've canned tomatoes without peeling before and it's been good. Dicing them like this will make it even better. I pressure can my tomatoes so adding an acid isn't necessary. I think it's also easier. Actually, they will store for years and years (indefinitely). The problem is that they lose quality starting after the first year, but they don’t spoil if they were canned properly. I’m glad your 2-year-old tomatoes tasted good. The USDA has now approved steam canning. I much prefer it to water bath if I don’t use the pressure canner. I think you will love your chopper, Deb! I've had so many people try it and love it. And yes, canned food definitely does lose a bit of quality after it sits for a long time. So far, peaches have been the thing that I've noticed it happening with the most. After a year, they tend to start getting a bit softer than they are initially. And steam canning? I've never heard of it. I'll have to check it out! Glad that this could help you find a way to use up the last of those tomatoes! And yes, I do the pints the same amount of time as I do the quarts. I think according to the "pros", you'd only need to do them for 35 min. but I just always do the full 40 min. Happy canning! I tried your recipe name Mexican dressing and it was great. I have been looking for homemade dressing without the added ingredients that I don't know what they are. I use stevia for the sugar, cider vinegar, sea salt, combination of 3 oils, olive oil, avocado oil and walnut oil, and Walden Farms Amazin Mayo from Sprouts store which does not have soybean oil. Its a keeper, hummy for the tummy! I hear that Instant Pot is intending to make a pot that will be safe for canning. I will soon be 85 and have canned off and on all my life. Why would you have to add lemon juice to tomatoes, they are already have acid. I used to can whole tomatoes and never even heard of that, now I cook my sauce and can it. We have a squeeze strainer it separates out the seeds and skin. I used to turn it by hand till hubby took over that part and he installed a motor! How do you think the diced tomatoes would work in a tomato juice rather than water? You actually don't add any water to the jars before you can the tomatoes. As the tomatoes cook they create juice naturally. In fact, if I drain the tomatoes before I use a jar, I often collect the drained juice and use it in place of tomato juice in recipes. Hope that helps! After canning for the directed 45 minutes I read that this cold pack canning needs 85 minutes of processing time. This made me nervous so I put my jars in the fridge and will cook with them this week. What is your opinion? Susan, my opinion is that if you added the lemon juice and the jars sealed that they are totally fine. This is the method that my grandma, mom and I all have used for years and from my understanding, there is no safety issue with it and no need to can them longer. But that is just my opinion and you need to do what you feel comfortable doing, obviously. Thanks so much! They have the lemon juice and are seal d. They sure do look lovely! This was my first canning experience and I needed a little reassurance. I appreciate your response. I'm so doing this tonight!!! Thank you for this straight forward recipe. I've been reading about canning tomatoes recently, and wanted to share something that I learned. Tomatoes are naturally acidic, but over the years they have been bred to be sweeter and less acidic, to be more appealing to customers. That may be why so many people have had success canning them without the addition of lemon juice in the past, but to be safe it makes sense to add it now. I wonder if anyone has recorded the pH of tomatoes in, say, the 50s to compare to current-day? I would be fascinated. It also makes sense why old-school marinara recipes call for sugar, to balance the flavor, but I find that it isn't needed. Bridget, that is so fascinating and makes so much sense! Now you have me wondering if you only use heirloom tomatoes if you still have enough acidity to be okay since they wouldn't have been changed at all. So interesting. Thanks for sharing! I feel just a little jealous of that truck patch! Or maybe I should say the results of the truck patch. :) I know how much hard work that kind of thing is! As for your question, I never have used canning salt but did a little research and it appears like it's basically salt that doesn't cloud your canned goods, so from what I can tell, yes, you should be able to use it in place of regular salt. Happy canning! Do you put any water in with the tomatoes before you can them? No, no water is needed! The tomatoes naturally produce juice as they can. Do you have to have a lid on when water bath canning?? The lid on the canner? No, I'm sure you wouldn't need to, but if the lid is off, heat will escape and you'll essentially be wasting energy. I did not see quantity of tomatoes to use for this recipe. How many do you use? Hi Jen! Actually, the quantity doesn't really matter. Basically, you just need enough tomatoes to fill as many jars as you want to can. So you can do just 2 jars... or 102! :) I typically just buy a bunch of tomatoes (or use whatever I've grown) and dice them up, filling jars as I go. Hope that helps! What do you think about adding a little olive oil & minced garlic? I'm not sure if adding oil to canned things before canning them is okay. I'd probably just wait and add that until after it's canned, when you go to use the tomatoes. But the garlic should be fine! I have a crazy amount of tomatoes and am looking to make anything tomato. I love your recipe and how super easy it is!!! I use diced tomatoes a lot so I’ll be making these a few more times. Jealous of that crazy amount of tomatoes that you have. :) And isn't this recipe just the easiest?! It always quickly makes me feel successful! For heating the lids, you can also buy a magnetic "lid lifter" to get the lids out of the hot water. It's a gadget, but I really like having it because you never have to touch the lids with your hands. Just lift out a lid, press it on a clean town to get rid of any excess moisture, and place it on the jar. Thank you so much! This was super helpful!! What about the seeds? I have canned tomatoes for using as soup and it's driven me crazy noticing the seeds. Or do you find you don't notice them when using them for diced tomatoes in fuller recipes ? I'm funny about seeds in food too...can't stand them typically! But with this, I don't mind them because like you said, the recipes are fuller and there's other things that mask the seeds. For tomato soup though, I prefer to use tomato juice that has the seeds strained out. should i add water or just put them in the boiling water with no extra liquid in the jars? 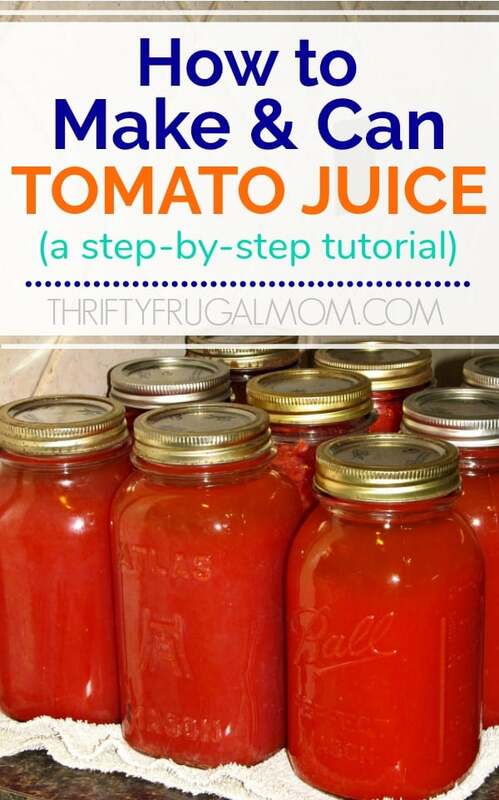 You don't need to add any extra liquid to the jars...just the tomatoes. They will create juice as they cook. Also, just to clarify, the filled jars actually go in the canner when it's still cool and then you bring it to a boil. Happy canning! Good morning I came across your post on canning diced Tomatoes. I will be doing this today however I saw you had used quart size jars and you stated to process for 45 minutes. What is the suggested time for small jar the size of jelly jars? Becky, smaller jars should be okay to process for 35 minutes instead of 45. Happy canning! What is a 'canner'? Is it jus t a large pot? Kind of. But it has a rack to place the jars in so they don't rattle together and break while boiling (see this). It's not really recommended to can without the rack, although I think you can maybe purchase the rack separately if you have a pot that it would fit in.